The aircraft from the German Messerschmitt Bf.109G JG 54 fighter squadron after landing. Leningrad Front, 1941-1942. 54th Fighter Squadron (Jagdgeschwader 54, the JG 54) «Grünherz» ( “Green Heart”) – one of the most celebrated of the Luftwaffe squadrons, perhaps the best of them. 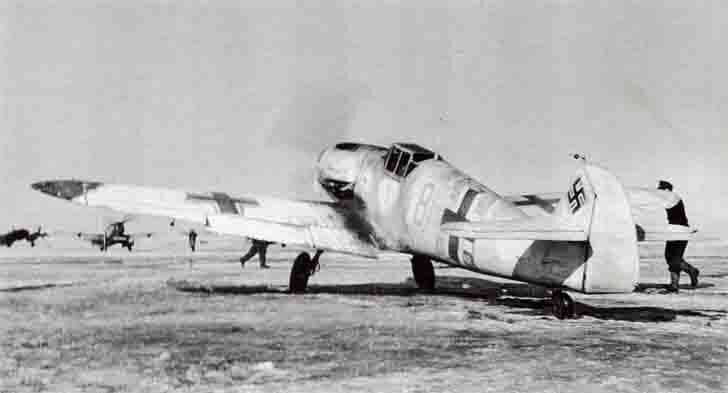 54th Fighter Squadron known lowest level of losses in World War II, though on the Eastern Front in the battles against Soviet fighters killed many pilots of JG 54, including aces, such as the Max-Helmut Ostermann (102 victories), the score for that point (9 August 1942) Luftwaffe fighter pilot. JG 54 aircraft carried on their sides image of a green heart. Messerschmitt Bf.109G belonged to Feldwebel Siegfried Müller (27 victories on January 4, 1943).